Looking for a tech job in Vermont? Want to scope out the local start-up scene? 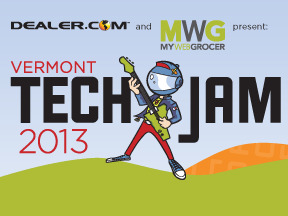 Then mark your calendar for the 2013 Vermont Tech Jam, brought to you by Dealer.com and MyWebGrocer. This two-day job fair and tech expo will gather dozens of Vermont's most innnovative companies and organizations all under one roof. It's an opportunity for job seekers, career changers and students to talk with recruiters, participate in panel discussions and other programs, and find out about educational opportunities available right here in Vermont. This year's Jam takes place the weekend after MyWebGrocer's Hack VT, a 24-hour coding competition — and it returns to downtown Burlington, Vt.
Want to exhibit? Interested in sponsoring the event? Got an idea for a workshop or a presentation? Drop us a line. We'll have more information on programming in the weeks and months to come. And check out what past exhibitors, sponsors and attendees have to say about the event.